years—paying the dues to sing the blues. Personal and evocative, C. Steven Blue presents another set of revealing and inspirational wordsongs. record album, with side one and side two, but instead of songs it is comprised of a style of poems that are called wordsongs. Each book is a concept album, with a general theme running through it, told in verse format. 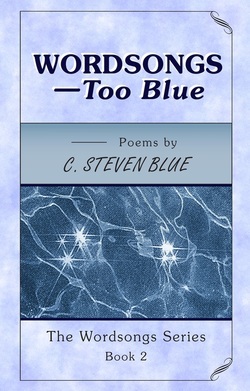 If you purchase WORDSONGS - Too Blue here, it can be signed by the author.